There are numerous types of congenital craniofacial differences, the most common of which is cleft lip and/or palate. In the United States, this condition affects approximately 7,000 newborns each year (Parker et al., 2010). Roughly one-half of these infants have associated malformations, either minor or major, occurring in conjunction with the cleft (Jones, 1988; Rollnick and Pruzansky, 1981; Shprintzen et al., 1985). Although the incidence figures for more complex conditions or syndromes such as Apert syndrome, Crouzon syndrome, mandibulofacial dysostosis or craniofacial microsomia are much lower than that for cleft lip and/or palate, the impact of craniofacial birth differences must be viewed in terms of the aggregate effect rather than the impact of any single entity. This impact is twofold: the patient and family and on society as a whole. The health and well-being of all of these children is dependent upon the clinical expertise of those who serve them. Quality of care positively impacts society as a whole by allowing the affected individual, through ongoing and excellent medical intervention, to make a positive contribution within their community. Although the treatment of children with cleft lip and/or palate and other types of craniofacial differences in the United States has improved dramatically, many children still receive care that is substantially inferior to what can or should be provided. Inadequate care results from diagnostic errors, failure to recognize and treat the full spectrum of health problems associated with these differences, unnecessary and poorly timed treatment, and inappropriate or poorly performed procedures. Each of these persistent problems was addressed in the course of the consensus conference. Management of patients with craniofacial differences is best provided by an interdisciplinary team of specialists. 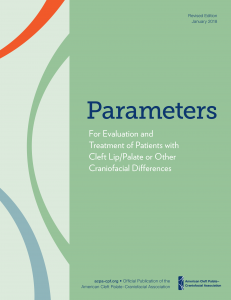 Optimal care for patients with craniofacial differences is provided by teams that see sufficient numbers of patients each year to maintain clinical expertise in diagnosis and treatment. The optimal time for the first evaluation is within the first few weeks of life and, whenever possible, within the first few days. However, referral for team evaluation and management is appropriate for patients at any age. From the time of the first contact with the child and family, every effort must be made to assist the family in adjusting to the birth of a child with a craniofacial difference and to the consequent demands and stress placed upon the family. Parents/caregivers must be given information about recommended treatment procedures, options, risk factors, benefits, and costs to assist them in (a) making informed decisions on the child’s behalf, and (b) preparing the child and themselves for all recommended procedures. The team should actively solicit family participation and collaboration in treatment planning. When the child is mature enough to do so, he or she should participate in treatment decisions. Treatment plans should be developed and implemented on the basis of team recommendations. Care should be coordinated by the team but should be provided at the local level whenever possible; however, complex diagnostic and surgical procedures should be restricted to centers with the appropriate facilities and experienced care providers. It is the responsibility of each team to be sensitive to linguistic, cultural, ethnic, psychosocial, economic, and physical factors that affect the dynamic relationship between the team and the patient and family. It is the responsibility of each team to monitor both short-term and long-term outcomes. Thus, longitudinal follow-up of patients, including appropriate documentation and record-keeping, is essential. Evaluation of treatment outcomes must take into account the satisfaction and psychosocial well-being of the patient as well as effects on growth, function, and appearance. (1) interdisciplinary teams: composition, qualifications of team members, and general responsibilities of teams; (2) contemporary practices of the team during the early months of life of the patient; and (3) longitudinal evaluation and treatment, listing general guidelines and contemporary practices as they pertain to professional specialty areas. Jones, MC. Etiology of facial clefts: Prospective evaluation of 428 patients. Cleft Palate J 1988; 25: 16-20. Parker SE, Mai CT, Canfield MA, Rickard R, Wang Y, Meyer RE, Anderson P, Mason CA, Collins JS, Kirby RS, Correa A; for the National Birth Defects Prevention Network. Updated national birth prevalence estimates for selected birth defects in the United States, 2004-2006. Birth Defects Research (Part A): Clinical and Molecular Teratology 2010; 88: 1008-16. Rollnick, BR, Pruzansky, S. Genetic services at a center for craniofacial anomalies. Cleft Palate J 1981; 18: 304-313. Shprintzen, RJ, Siegel-Sadewitz, VL, Amato, J., Goldberg, RB. Anomalies associated with cleft lip, cleft palate, or both. Am J Med Genet 1985; 20: 585-595.